Title: Why do my earbuds keep getting entangled? I'll discuss the mathematics of random entanglements. Why is it that it's so easy for wires to get entangled, but so hard for them to detangle? Have you ever noticed that in colored maps of the US bordering states are never the same color? That's because it would be super confusing! But how many different colors do we need in order to avoid this? Come find out and learn more cool things about coloring maps. Title: 1 + 1 = 10, or How does my smartphone do anything? Computers are used to do all kinds of complex tasks, from playing videos to running internet browsers. Secretly, computers do everything through numbers and mathematics. Surprisingly, they do all of this with "bits", numbers that are only 0 or 1. We will talk about bits and how we use them to do the mathematics we're familiar with as humans. If we have enough time, we will discuss "addition chains" and how computers use them to speed up their computations. If you give me a function, can I find a simple function that approximates it well? This question played a central role in the development of mathematics. With a couple examples we will begin to investigate this for ourselves, and we'll touch on some interesting relationships to modeling random processes. Some say that mathematics is the science of patterns, and patterns are everywhere. You can find some remarkable patterns just by drawing lines connecting dots, and that is just what we will do in the game of Criss-Cross! Bring your pencils and be ready to play. By chopping up rectangles into squares repeatedly we obtain so-called "slicing diagrams" that correspond to every number. These diagrams have some very cool properties, and show up all over mathematics (under the name "continued fractions," which name we will investigate). Some questions I may ask you: Which chocolate bars look like themselves? Which chocolate bars look like themselves, except bigger? Which chocolate bars are interesting? Why did you come to a math talk expecting real chocolate? When you are told to clean your room, you have to first clean half of it; then half of what's left, and half of what's left, and so on. Seems like you will never be done! In fact, an ancient Greek philosopher, Zeno, used an argument like this to claim that it is impossible to move! Disclaimer: we are not saying that it's impossible to clean your room. What we will do is look at a special case of adding infinitely many numbers together, and use the resulting formula to calculate areas of fractals. We’ll talk about the pythagorean theorem and areas of circles/triangles, and then use those tools to solve some cool problems! We will discuss various fun logic problems involving colors of hats. The participants will also have a chance to win some of the speaker’s leftover Halloween candy. I think my dream home would be in the fourth dimension. I'd have a lot more room for activities. We will draw blueprints, build models, and measure how much more room we'll get by using mathematics to extend our understanding of 3 dimensions to 4 or beyond. How many ways are there to place 32 dominoes on a 8x8 chessboard? (Dominoes cover exactly two squares, and should not overlap.) This is a very tough problem with a huge answer: 12,988,816. But suppose we want to only place 31 dominoes and leave two opposite corners empty. It turns out that the question is then almost trivial: such a placement is impossible. (Hint: The reason has to do with black and white squares on the board!) We will look at problems that can be solved by a clever coloring design. An ancient Greek philosopher Epimenides famously said "All Cretans are liars". Ignoring for a moment the fact that Epimenides himself was from Crete, what would happen if he was right? How could we get information from people who always lie? Or, worse, what if among these lying "knaves" are some truthful "knights"? How could we tell which is which? Using some tools from logic, we'll explore this and some other questions of the same sort. We will explore the mathematics behind soundwaves. This will include dissecting the structure of soundwaves, understanding why they create certain tones, and discovering how sound cancelling headphones work. If time permits, we may even talk about whether you can "hear the shape of a drum." Using a concrete problem in combinatorics, I will try to give a feel for what math research looks like. We’ll discuss the various aspects of research including: gathering data, making conjectures, proving special cases, and asking new questions. gur pbearefgbar bs gur zbqrea jbeyq eribyirf nebhaq orvat noyr gb rnfvyl pbzzhavpngr frpergf, jurgure gubfr frpergf or perqvg pneq ahzoref ba nznmba, grkg zrffntrf ba lbhe vcubar, be frpher tbireazrag nssnvef. va guvf gnyx jr jvyy rkcyber gur zngu haqrecvaavat bhe novyvgl gb qb guvf, naq frr whfg ubj fgheql gung pbearefgbar npghnyyl znl or. So you go off to college and after a year or two, you and some of your friends decide to get an apartment together. It'll be a lot of fun living with your best friends. Then move-in day comes, and you realize that everyone wants the room by the kitchen (for easy late-night snacking). You have 4 rooms and 4 people. Surely there must be some way to make everybody happy. People are willing to settle for their second-favorite room instead if maybe they pay a little less rent or do some less chores. How do you navigate this issue to make everybody happy? I'll share a way to do this based on a mathematical theorem which also explains the following fact: If you stir up a cup of hot chocolate, when the liquid has come to rest, some point in the liquid will end up in exactly the same place in the cup as before you stirred it. In this talk, we will work to discover a beautiful formula that allows us to quickly and easily compute the area of a polygon whose vertices are points of a grid. We will prove that this formula works! In my boredom I would often wonder about things like "Will I have a date for prom" or "What is the cafeteria serving for lunch today? 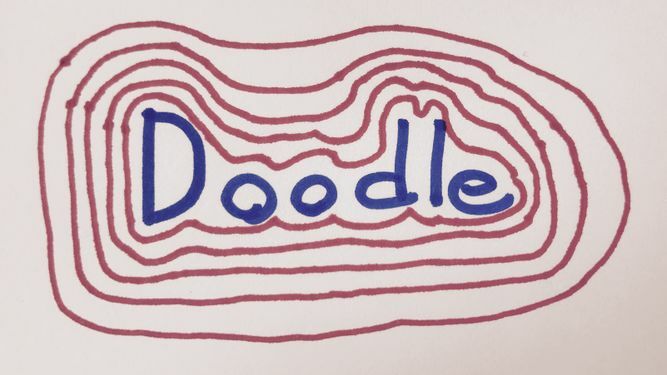 ", but germane to this talk were my wondering about, "What happens to the shape of this doodle?" It turns out that these idle daydream and doodles provide an good taste for how mathematicians "do" math. We will start by doodling and asking questions, and see where these lead us mathematically.